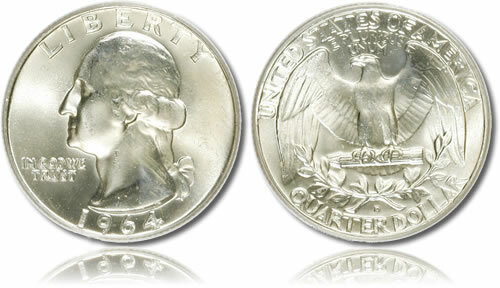 The Washington Silver Quarter was struck by the United States Mint from 1932-1964 from a composition of 90% silver. When originally minted, each coin contained .18084 ounces of the precious metal. The United States Mint started striking the Washington Silver Quarter as part of a celebration of the 200th anniversary of the birth of the first President of the United States, George Washington. Designs for the coin were submitted by several individuals participating in a competition. One of those individuals was John Flanagan who had worked as an assistant to noted artist and coin designer Augustus Saint-Gaudens. Flanagan’s portrait of the first President was chosen in the competition and has proven to be so classic that it has graced the obverse of the quarter dollar ever since. Only slight modifications to the design were completed with the introduction of the 50-State Quarters® Program from the US Mint in 1999. The design was reverted back to its original status in 2010 when the America the Beautiful Quarters® Program was launched. While millions of these coins were struck, it should be noted that the United States Mint produced none of them in 1933. As previously mentioned, a portrait of George Washington, the first President of the United States, is showcased on the obverse of the Washington Silver Quarter. It was designed by John Flanagan with the original silver strikes containing the inscriptions of LIBERTYT, IN GOD WE TRUST and the year. The reverse of the Washington Silver Quarter shows a bald eagle also designed by Flanagan. The wings of the eagle are out-stretched as it stands perched. Surrounding the design are the inscriptions of UNITED STATES OF AMERICA, E PLURIBUS UNUM, QUARTER DOLLAR and the mintmark, if present.